I received this ink as a sample from a member on FPN. 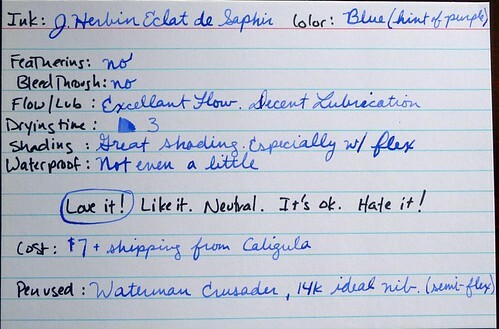 I confess, I never thought of buying it because it seemed too similar to Quink Washable Blue and De Atramentis Sapphire, both of which I have. Let me tell you, there is just something about this ink that sets it apart from the rest in its class. I think it’s the vibrancy of this ink. This is hard to capture in the picture, but this ink jumps off the page at you. As mentioned below, It goes down with a hint of purple, but dries to a very nice medium blue. I definitely recommend this ink, and plan to buy a bottle once I’ve worked my way through the sample. Flow and Lubrication are both great. Drying time is average: 10 secs. with the broad nib and 5 secs. with the XF nib. Shading is amazing especially with a broad nib. Lefties should watch out for smearing until the ink is completely dry. It’s not waterproof but can survive a quickly cleaned up spill. Saturation is not high but is still good so far as I’m concerned. This first photo is the best color representation of this ink. If you have a Fotki Account you can click the image below for a larger view.